Our human body unit has come to an end. 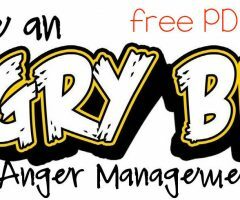 Tomorrow I will be posting a list of our resources/printables- but as far as my daughter is concerned- we are done! And it feels good. This has been quite an educational journey for Boo and I. Tootsie (one of the MANY names we have given this human body chart) has taught us a lot about the body and how it works. The skin and hair were really quite easy. We watched a video about the skin (Boo probably replayed this video 30 times) We talked about how our skin gets wrinkly after we take a bath. 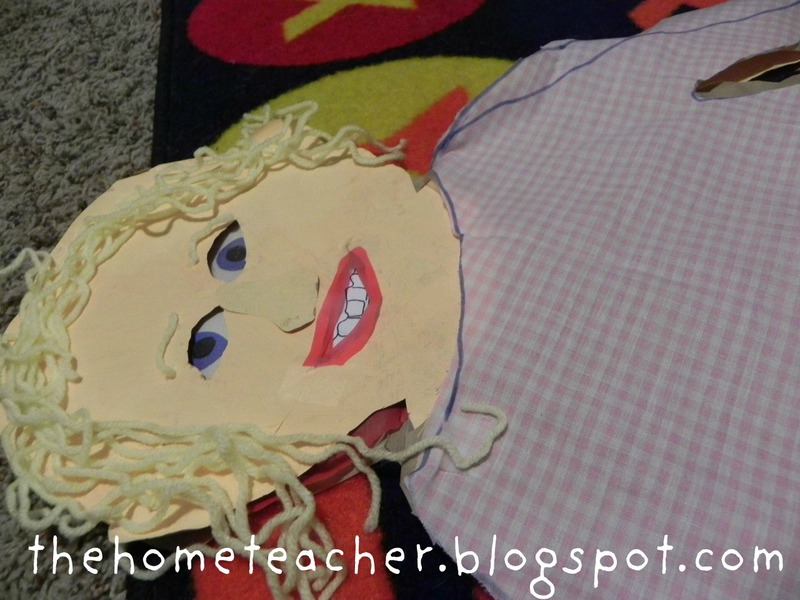 I had 2 extra body cutouts that I made- we took one for the skin- which we placed on top of the bones. We painted the skin a peachy color, and it looked marvelous. Then we put it on top of the bones and it didn’t line up AT ALL. Somehow all the body cutouts that I cut at the same time are a bit different. I set to work cutting off limbs and taping them back together so it would match up more… in the end it looks better, still not “perfect” but we are happy with it (or do I say her?). Another adjustment I made was taping the muscle layer underneath the skin layer- the red plastic was just too floppy on it’s own. The hair was just yellow yarn- we also added yarn eyebrows. The second extra body cut out was used as a frame for clothes. Painting the skin… It is REALLY hard to see the body on top of the matching dropcloth (brown paper courtesy of Amazon.com- thanks for sending us yards of this brown paper with our last purchase) And I have admitted this in the past- we love to craft on the floor! 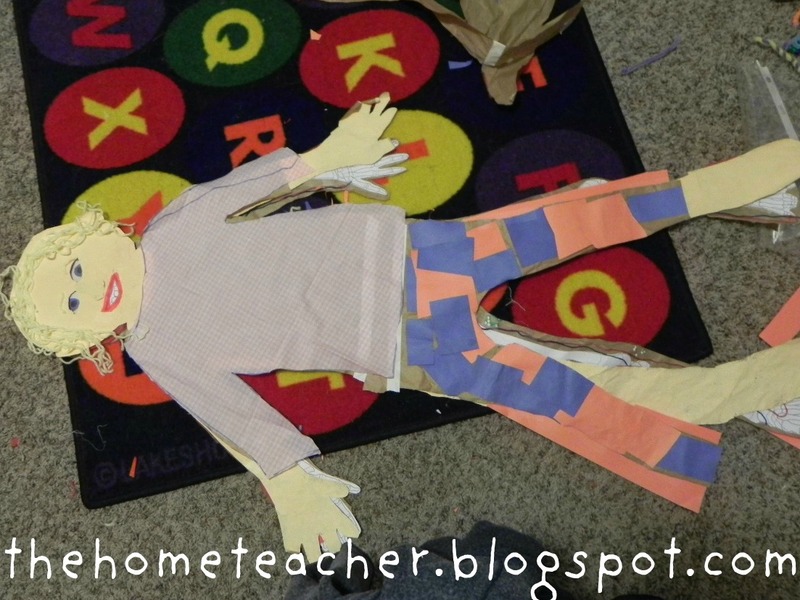 The clothes layer was our third body cut-out- minus the head, hands, and feet. 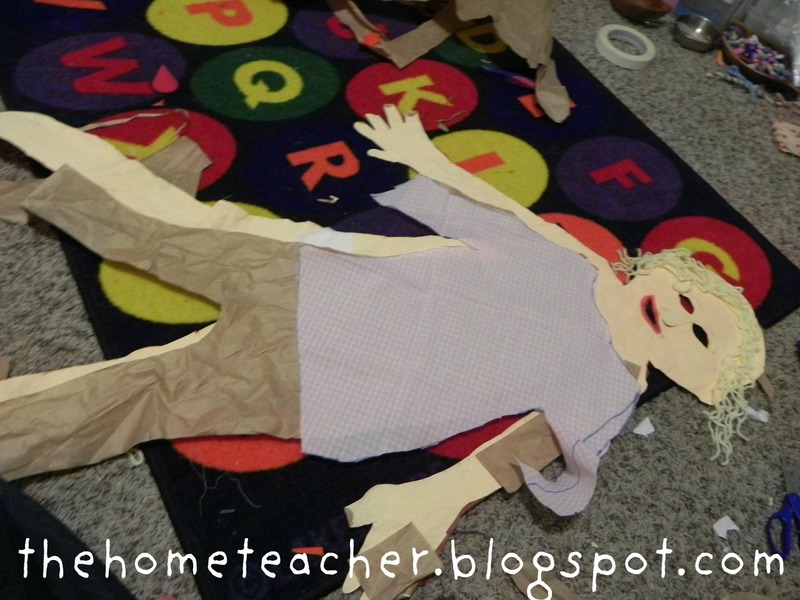 Boo and I used material to cut out a shirt, which we glued onto the brown paper. 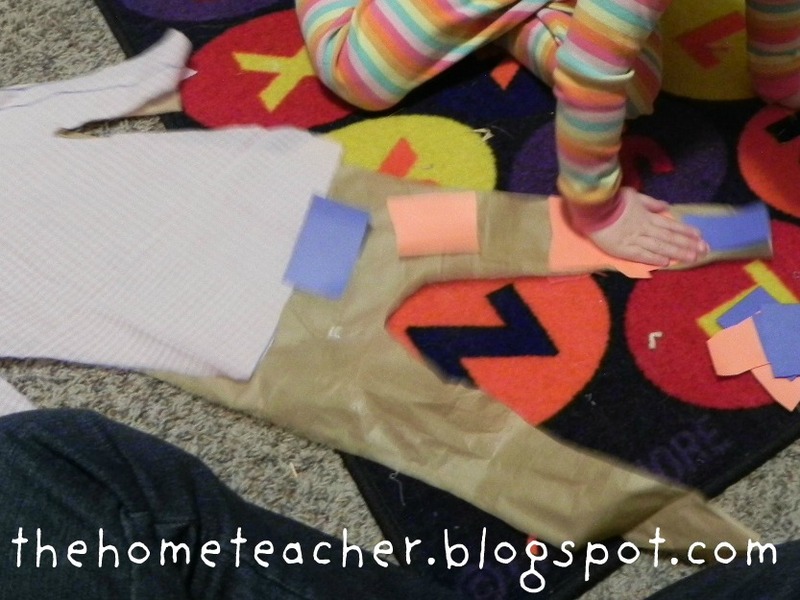 I used the brown paper for two reasons- first, it gave her clothes some support so they weren’t floppy, and second, I didn’t want to attach the clothes to the person- because we did it this way I am able to tape the clothes layer on her shoulders. If that makes sense…. For pants, Boo wanted to cut out orange and blue paper. She is all about the scissors recently. Voila! Our person! You can see that the three body cut-outs aren’t a perfect match. Learn from my mistake- make sure that the layers line up correctly before you invest a lot of time into the project! I just love this side look of Tootsie. I honestly admit- this is one girl that is definitely more beautiful on the inside than out. 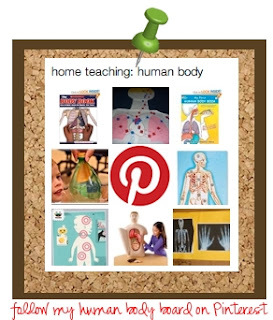 This weekend our final human body post will have all links to all our printables and resources! 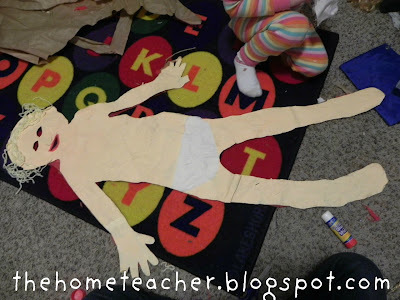 This entry was posted in explorations, human body, learningtime, science and tagged skin on March 2, 2012 by ktoponce. Boo and I have been a slacking in doing our Montessori Jar since we moved in December (OK, truth be told we had been slacking WAY before our move, and most of the activities that were in her jar mysteriously disappeared only to be found smushed in her plastic vanity drawer where they are at this very moment). 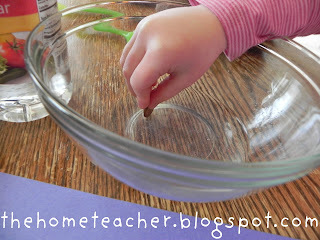 Needless to say, I am excited to be back in the Montessori activity game! 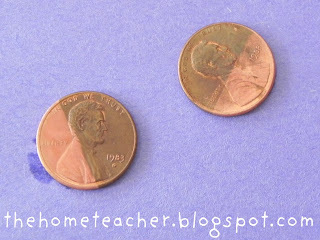 I found the cleaning penny idea at The Science Explorer. 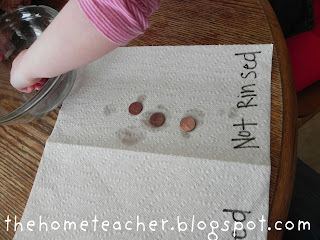 We set to work gathering the materials- 20 dull and dirty pennies, 1/4 cup vinegar, 1 teaspoon salt, clear shallow bowl, and 2 paper towels labeled “Rinsed” and “Not Rinsed” (the website suggests doing activities with nails and bolts- we just stuck to the pennies). Stir salt in the vinegar until its dissolved. This was a great time to discuss with Boo what “dissolves” means. Half of your penny is clean! So cool!! After doing this a couple times (since it was super exciting for both of us), dump all your pennies into the vinegar/salt mixture. After 5 minutes, take half your pennies and put them on the “Not Rinsed” paper towel. 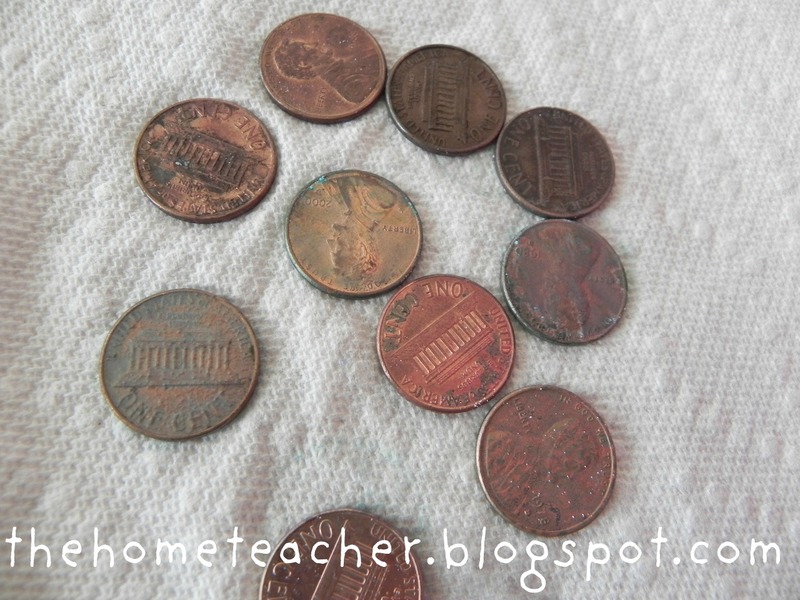 Take the other half of your pennies and rinse them well. 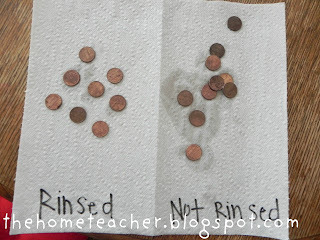 Place these on the “Rinsed” paper towel. And now it’s time to wait. 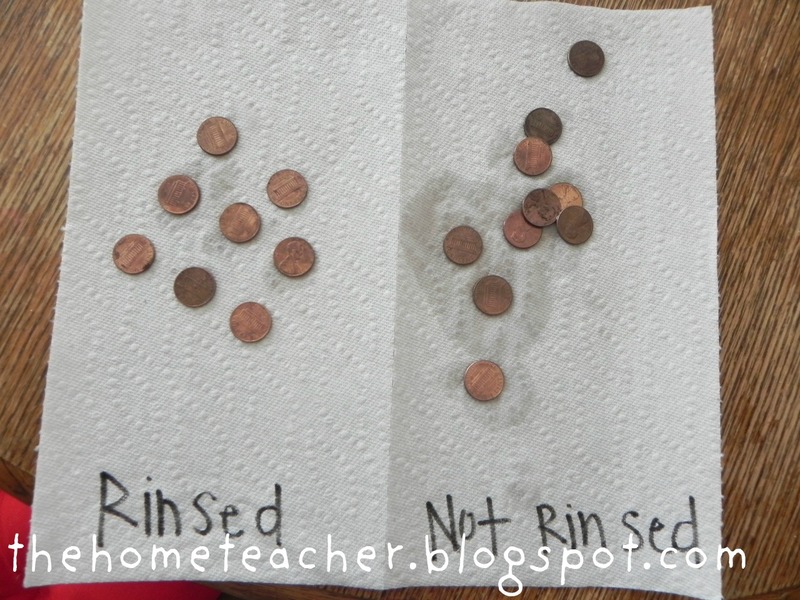 After one hour, the “Not Rinsed” pennies will have a nice blue tint to them! The reason is that the copper atoms are joining with oxygen atoms and chlorine atoms from the salt. 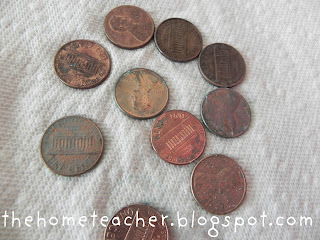 This entry was posted in explorations, learningtime, money, montessori, science on March 1, 2012 by ktoponce. This is the area of the human body that my daughter has been so anxious to study! Hilarious, seeing though most people are grossed out by the whole process. 🙂 I have to honestly admit that I, as an adult, am learning so much about the human body. Our body has a digestive system now! Yippee! 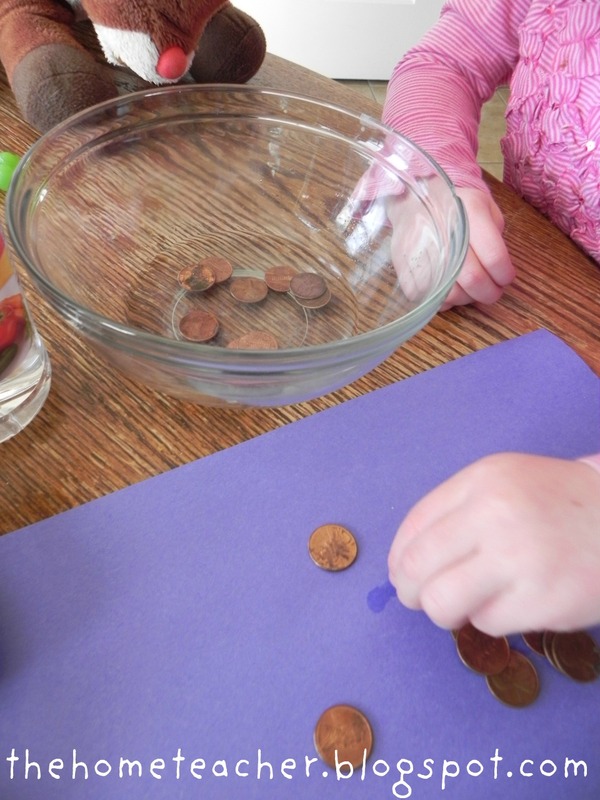 We did a couple activities to start off our learning exploration. First, we just talked about the whole process. Boo was just naturally inquisitive about this topic, so it wasn’t another boring lecture (think of Charlie Brown’s teacher!) I explained everything from the mouth to the large intestine and everything in-between. We also talked a little bit about the liver and how it produces bile. This was especially of interest to Boo because our dog Sammy had a sock stuck in his duodenum (part of the small intestine) and would throw up bile. At first Boo was proud that Sammy threw up the icky green liquid- I had to explain to her that bile coming out of our mouth is not a good thing! Our next learning activity was watching this short clip on the digestive system. My daughter thought this was SO fascinating. I like that it was short and sweet, and used proper terminology. I got the idea to use this clip from Spell Outloud. We watched the movie AT LEAST five times per Boo’s request! It was time for a more hands on activity using a paper towel tube, baggie, water, and bread (another activity inspired from Spell Outloud. The paper towel tube was our esophagus and the bag of water was the stomach and stomach acid. As we put pieces of bread into the esophagus, we discussed how it is a tube with muscles that help move the food down towards the stomach. Once the bread reached the stomach, we talked about how the acids break it down into smaller pieces called chime. 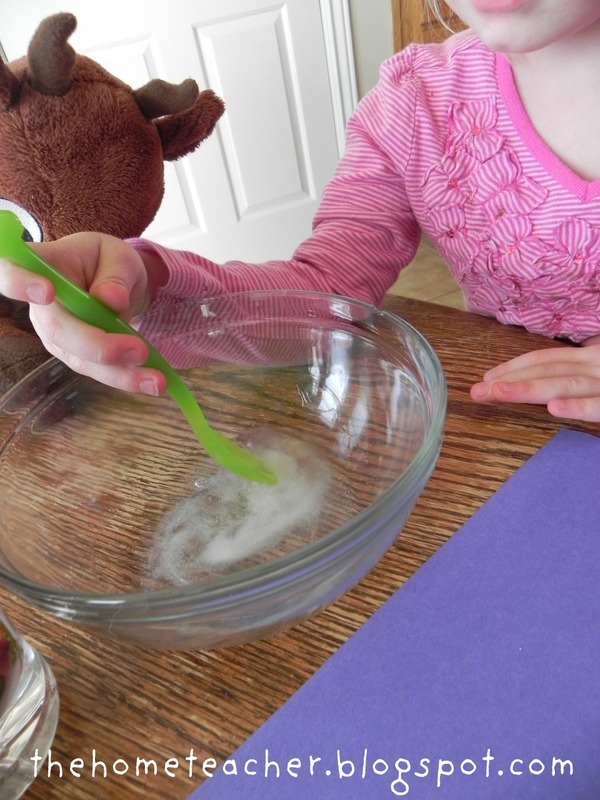 As you can imagine, watching bread turn into a liquidy goop was extremely fascinating and we had to repeat the experiment a few times. “WOW! Can we do this AGAIN?” I just love this face! The last step was adding the digestive system to our body! I know the proportions are off a bit- but I am still happy with how it turned out! The lower part of the digestive system: liver, pancreas, gall bladder, stomach, and small and large intestines. I hope that in some way this will help and inspire you as you teach your kiddos about the digestive system! For more ideas on the human body, follow my board on Pinterest! 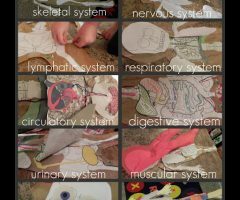 This entry was posted in human body, learningtime, science and tagged digestive system on February 2, 2012 by ktoponce. It’s time for another post on the human body! Today we talked about the circulatory system…. more specifically the heart, arteries, veins, and lungs. Before we set out for our activities I had two goals: First, I wanted my daughter to know that the red arteries deliver oxygen, while the blue veins carry out the “garbage” (the term carbon dioxide was not part of today’s lesson!!) The second goal was to add the circulatory system to our human body. I drew an enormous chalk figure of the human body in our unfinished basement, and made sure to include the trachea, lungs, heart, arteries, and veins. I also pulled out my red and blue unifix cubes for the blood. I also grabbed some cans of silly string we had sitting around. Example #1: We tossed all the red cubes in a ginormous dump truck from my daughter’s sandbox. I told Boo that the blood goes to the lungs to get air, then we blew on the red blocks. We delivered red oxygenated blood by “driving” the truck down the arteries and tossing red blocks throughout the body. Dispersing the oxygenated blood by driving the truck down the artery path. The dump truck then turned around, and drove up the veins while Boo picked up the blue blocks- AKA garbage (for older kids I would use the term carbon dioxide!). Collecting the garbage (carbon dioxide) into the dump truck and driving it back to the heart up the vein path. When the truck got back to the lungs, it dumped out the garbage, then we ran it up the trachea and breathed it out! I know a lot of the technical stuff may not be remembered, but we had fun…and at the end of the day, thats what counts. Example #2: We cleaned up the blocks and played the game again, but this time we used silly string. And it was a lot more captivating. We started at the heart, went to the lungs to get our air, then back down the heart and into the arteries. My daughter enjoyed squirting the silly string throughout the body, although she had a difficult time pushing down on the valve. The silly string…I mean oxygen…. was picked up in the trusty dump truck along the vein path and hauled away to the lungs, were it was exhaled. After picking up the carbon dioxide (silly string), Boo dumped it into the lungs. Right after doing this, she picked up the silly string and exhaled it by running up the trachea and out the mouth. After our kinesthetic illustrations of the circulatory system, we went upstairs and added the components to our human body chart. The heart was printed out from this site, and the veins and arteries were pieces of old embroidery floss (yarn would work just as well). Look at our body develop- this is turning out to be such a fun project!! We had plans to make a stethoscope and listen to our heart beats, but that didn’t happen…. we were able to feel our heart beats with our hands before and after running around. This is a great time to discuss why our heart beats increase when we exercise and the importance of oxygen to our muscles. I couldn’t resist adding this cute School House Rock video on the circulatory system. It’s classic, educational film at it’s best. This entry was posted in human body, learningtime, science and tagged blood, circulatory system, heart on January 22, 2012 by ktoponce. The past couple of days we tackled the respiratory system. It was a bit of a challenge to get Boo excited to learn about lungs… honestly, how many four year olds are excited to learn about lungs! And although she was convinced our lung activities would be boring, we ended up having a pretty good time. And I think we actually learned a few things along the way!!! We started our breathing exploration playing a fun game called Oxygen Cycle. 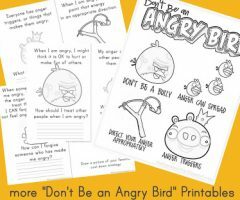 I adapted the game I found at PE Central to meet the needs of my four year old. To play this game I drew an outline of a person with sidewalk chalk… making sure to add a mouth, trachea, lungs, and muscles. The only supplies you need are beanbags. The oxygen (pile of beanbags) started out at the mouth. Boo would run to the mouth, get some oxygen, run down the trachea path, through the lungs, and then to a muscle. When she got to the muscle she would have to perform a little exercise- like arm circles, jump in place, etc- until she ran out of oxygen. Then it was back through the lungs, trachea, and to the mouth to get more oxygen and repeat the process. And while we were playing Boo made some adjustments- like deciding it was much more efficient to ride her bike down the trachea path instead of running. And then piling her bike with ALL the beanbags instead of going back and forth. 🙂 We both had a good time, and that’s what counts! Our little family spent an evening doing various lung activities (found here). We took a straw and taped string on the end. Boo blew into the straw and watched the string elevate. The longer/deeper the breaths were, the longer the string would float. The same concept was also illustrated by blowing into a harmonica. Deeper breaths would play longer notes, and shorter breaths would play shorter notes. We practiced blowing feathers with deep/short breaths. And then we made a lung! It was SO much fun! 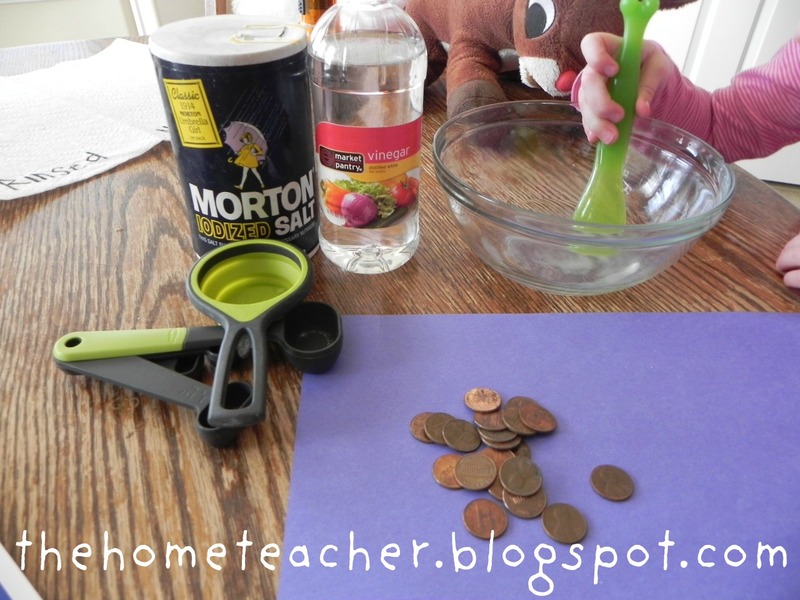 A must-do if you are planning on teaching your child about the respiratory system. I followed the steps found here and it worked perfectly. A great visual of the trachea, lungs, and diaphragm. And how the diaphragm contracts during the breathing process. Boo was able to see that the diaphragm goes down to create room for the lungs as they expand. We glued some bubble wrap on top of the lung picture (since there is air in our lungs) and added a diaphragm. 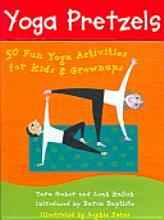 Last but not least… a great resource in teaching kids yoga breathing techniques (as well as lots of other yoga poses). This entry was posted in explorations, human body, learningtime, science and tagged respiratory system on January 16, 2012 by ktoponce. David Gettman suggests the following sequence for teaching culture. Included in the list are some activities that I have found online. Enjoy! classifying animals- Montessori Materials has animal classification labels. 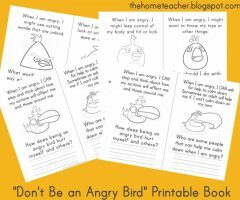 These would work great as 3-part classification card activity! classifying leaves leaf shapes and leaf forms 1,2, and 3 from montessori materials and for the advanced child- check out this incredible pdf of leaves from Temple of Ganesha– everything from a bazillion different leaf shapes to leaf venation. Wow. plant life cycles- online tutorial for kids on the plant life cycle- from seed to dispersal. Youtube also has several different time lapse videos of seeds growing that are pretty cool! You must check out this detailed scope and sequence of geography pdf. It is amazing! 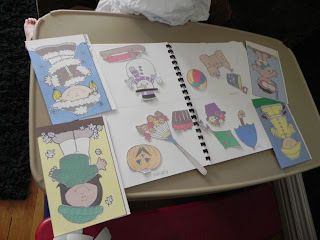 This entry was posted in cultural activities, geography, learningtime, montessori, science on November 11, 2011 by ktoponce. 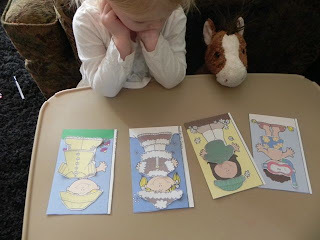 My little gal and I recently learned a little bit about weather and the seasons. We didn’t spend a lot of time on this unit since there were some glorious days that were SO nice that we opted to go play outside instead! Learned about a thermometer and watched the mercury change in different temperatures. Sorted seasonal items in our exploration journals and talked about different holidays during each season. Dressed weather people according to the season. This unit was at the perfect time- This week we have had rain, snow, hail, wind, and sunshiny days! This entry was posted in learningtime, science, seasons, weather on April 7, 2011 by ktoponce.